Tested Rift in some demos... this is truly impressive! But very sickeningly, especially if you do not rotate view with your head (I mean if view is rotated by mouse or by demo engine). I need develop my own system for SpaceEngine. Yes many apps for the Rift have to cut cinematics and non-user-controlled camera mouvements. However slow movements can work like in Titans of Space (you should really try this one, as a relaxing experience). Also, the very first Rift session is often disorientating. Also, try using Outerra with the Oculus, again fast speed is nauseous, slow speed is rather ok. I'll be happy to help if i can. Maybe dev kit 2 will blow this defaut away. Once again you loose this sensation of nausea if you work it but there are some tricks to pull down this sensation. If you are in a vehicle (like titan of space or space combat games), so when you move with you mouse/joypad/gamepad, that is the ship that's moving not your body, but you need to see your body and your movement must be real in this little space. Maybe you've got to pay attention to speed in travel too, teleportation maybe be great in order to kill it. I would think to be able to turn your head there you'd need to do what a lot of the demos do and give the player a "body" for where they're facing, with separate head tracking. For example, with The Gallery: Six Elements (great demo by the way if you havent tried it), you're still able to walk forward while looking in any direction. When the lightspeed travel occurs you'd want to only turn the players body positioning, keeping the head viewing completely separate from the direction. This would also effect normal moving around, where moving "forward" isn't where you're looking, but where your body is. Engine renders two separate frames very well, with no optimizations FPS drop is 15-20%. A lot of work required on GUI - all dialogs must be changed to fit small Rift resolution. Maybe simply scaled down? Test will show. SpaceEngineer, now I have to buy Oculus Rift, lol. How many metres between your eyes there? Cross-eyeing makes me fell I'm only some cm above ground in that picture. Hi SpaceEngineer, this looks great. An ergonomic idea that comes from the latest version of Titans of Space: looking directly at a button for more than 2s is like clicking it with the mouse/joystick. Very good to avoid breaking immersion. Maybe you can use it for some simple actions. 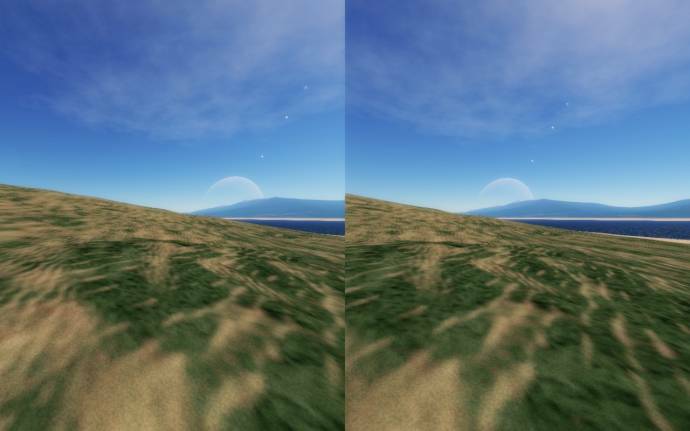 I think the eyes aren't so far apart, but the convergence seems to be too near; the "in-game eyes" seem to be crossed slightly, looking at the big differences in how far the most distant objects are from the image edges. For example: the top of that big planet is about 203 pixels from the right-side edge for the right eye and about 340 pixels from the right-side edge for the left eye. These distances from the edge should be -for the most distant objects- practically the same when looking into infinity. Hey guys, this is just very first test render, no more! Anyway, i dream of this game in a virtual helmet. I'm very confident of this genre of experiment with the vr. What is better than travel in space, fly trough the universe like in a lucid dream ? Space Engineer you can make it happen, if the vr bubble explode in few month, you will be more visible, because space engine is like nothing else right now. It's beautiful, it's simple, it's unique. Please, for me, for you, for all the people, make it happen. Just another Rift owner here...waiting for this. Keep it up the good work Devs! I'm going to have to buy or in some way acquire (buy?) an Oculus Rift purely for the purposes of looking around me in the Space Engine universe and marvelling at it's beauty. I've been reading about the nausea effect when tilting not controlled by the user but in zero gravity and in a free floating spaceship out of control, this could well be happening and would probably seem at least as nauseating as it would using Rift. I Personally would look forward to making myself feel sick for floating through space, it'd really bring the experience home, you know! I think it would be so cool, if it were possible to have a specialised controller like one I remember seeing somewhere in this forum a while ago someone posted, like a big trackball type thing with some other bits on it. And if it were eventually possible to implement voice recognition "orbits on" / "Show orbits", "Display planet data" etc, that would suddenly do away with many of the difficulties relating to being able to control all the things requiring the keyboard in any case, whether using oculus rift or simply to experience a more immersive / realistic, less keyboardy trip. Welp. RIP Oculus. Guess what Facebook just bought. Yes. RIP. A good day for the Oculus owners though. It's hard to imagine any enthusiastic developers staying after an acquisition like this. Let's hope they had some shares and have ideas for a new company.